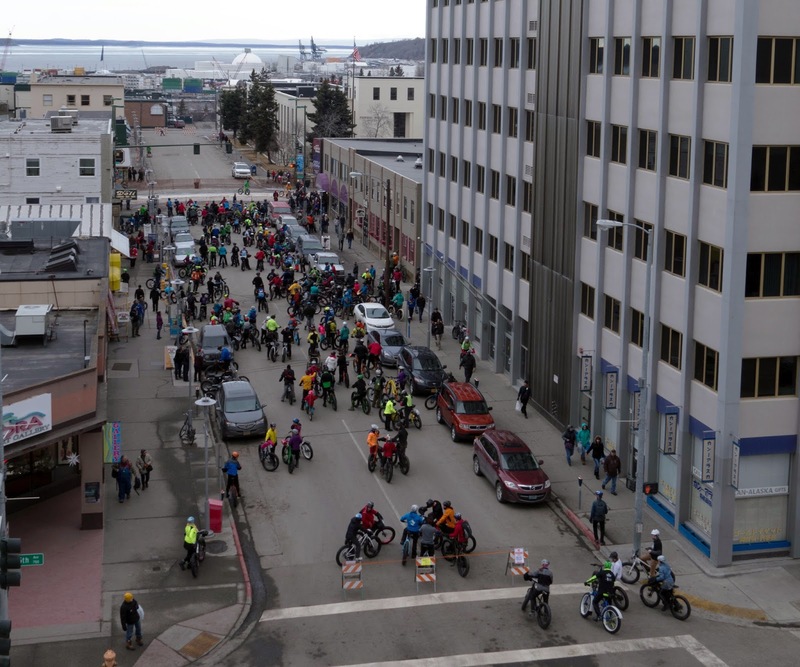 Cyclists gathering at the start of the Big Fat Ride in Anchorage on Saturday afternoon. I'm sorry to say I missed the event. I have full-on deer-in-the-headlights syndrome today, and the introvert in me just couldn't handle another big social gathering after the pre-race meeting. I watched it go off from the balcony of our hotel room, where I was still fiddling with my gear. As you can see, there's no snow in Anchorage. Temperatures were in the 40s on Saturday. I've been trying to guess what the first part of the Iditarod Trail might be like — of course until you're right on top of it, it's almost impossible to say. My guess would be swampy, icy, and slushy for the first 50-75 miles, followed by new, wet snow until mile 110, and beyond there, perhaps a lot of new snow moved around by recent wind events. There have been reports of standing water and Sunday's forecast calls for rain, so I'm mentally preparing for what I think of as "Juneau misery" for the first day, and gearing up as best as I can with extra plastic bags, an extra couple of pairs of socks, and gaiters (which I didn't plan to bring, but I want to keep my overboots dry and avoid wearing out my Wiggy's waders on the first day of the trip.) Forty below gets all the glory, but it's easy to underestimate how cold you can become when it's 40 degrees and raining, and you're pedaling through standing water and slush spray for 12-plus hours. Which means that I showed up in Anchorage hoping I'd cull some things from my bags, but instead added more. You pack your fears. I have a lot of fears. Judging by my performance at the Fat Pursuit last month, I expect to be very slow. I know I need to start out slow to avoid aggravating my respiratory system, so I have no doubt I'll be near the back of the bike contingent. If conditions are as soft as I expect near the Alaska Range, I'll probably be behind a few walkers as well. That's okay with me. Really. Just in case you're watching the race tracker and wondering what's wrong. Probably nothing is wrong. If my dot is still on the map, it's going well. Basically, at this point, I'll be pretty pleased with any result that doesn't include my race ending because I've fallen through thin ice and drowned. I am excited to get started, though. No matter what, it will be an adventure, and full of the intense experiences that make up my best memories. I am taking it one mile at a time, with no expectations and a goal only to stay on the trail as long as I'm healthy, and come home uninjured. All the very best, stay safe. "God Speed", and be safe. I'll be thinking of you. Here's to an awesome, epic adventure! Wishing you lots of good luck! Following the ITI has become one of my late winter distractions. Jill - Holding you in my thoughts and wishing you (and Beat) the very best experience on the trail! Will be following you along the way. Good luck. I'm proud and impressed already. Do it for you. See you later. My goal - to stay on the trail as long as I'm healthy, and come home uninjured. My sincere best wishes that you achieve this. Have fun! No snow (again) in Anchorage...not a good sign. Funny how the mind works...oh..40 degrees...that's WARM (when you're assuming it will be below freezing and possibly below zero). I gather they will have to move the start for the dog teams to Fairbanks again too...wow. Anyway, I know you're already out there (I just peeked, you're at 88 miles and moving right now...Monday morning, 7am Pacific time). Be safe and enjoy the slog! Prayers for a safe journey. You are an inspiration. interesting its so warm up there, at the other end of the country (ontario) its at -20oC with 20cm coming tomorrow. Gotta get my riding in tonight and tomorrow morning before the next snow hits.. Watching you via the live tracker - Go Jill!!! Good luck, Jill! Take it slow, breathe free and enjoy the glory of the trail (oh, the glorious trail!). 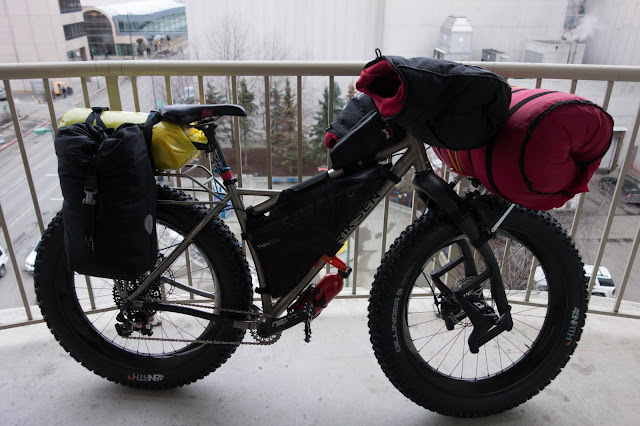 If you have time to post a quickie: Back in December Beat was going to ride the Ti Fattie. What gave rise to his decision to walk and not bike? 82.2% there!!! Wishing you a successful completion of the journey. Ride Long and Prosper....and stay warm. As always, looking forward to the race report and photos. Great job... was fun watching your 'JH' Spot-flag cross Alaska. Just checking in and see you FINISHED last night!!!! I guess the 1000 miles isn't quite a full 1000...you are listed at mile 936.5, with your last SPOT info recv'd @ 7:37pm Alaska time on 16 March. WAY TO GO JILL! It's been quite fun watching you and Beat's tracks...trying to imagine conditions (based on your speed and then the rest stops to recover). Can't wait to hear about it! And Beat is doing fantastic too...he's just under 700 miles and moving strong...about 6 more days for him...will you stay up in Nome until he finishes? Anyway, FANTASTIC RIDE!!! ooh....belay my last...you were tracked a Finisher at Nome at 5:26pm AKST 3/16/16...odd you were still showing SPOT data after that. (I just peered at the "view all" SPOT data page). Doing so well!! GO JILL!